Over the last year teams of three or four students have completed a major design project to develop a new product, with real business potential. Having first identified a customer need they have researched the market, developed original design concepts and created a full business plan. 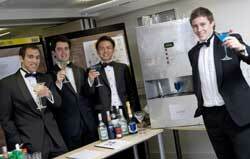 Deli'tail is cocktail machine that allows bars to offer cocktails fast and efficiently, whilst ensuring that quality is consistent by removing human error. It replicates the mixing process, which has been broken down into its elemental steps with a time and motion study. The machine selects ingredients from the top of the machine, adds water to mimic the effects of melting ice, thoroughly mixes the cocktail through proprietary technology, chills the mix to a refreshing temperature (around 4oC) and then pours the finished cocktail into the glass. Team: Jonathan Thompson, Chao Wang, Corentin Roux Dit Buisson, Andreas Petsas. 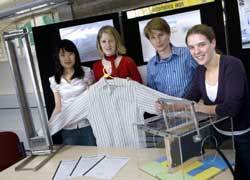 Development of technology to enable an automated ironing appliance. Representing a radical breakthrough in ironing technology, our product offers users an automatic means of removing creases from clothing, resulting in drastic time-saving for the busy user; unlike the traditional dry or steam irons which rely on manual operation. At the heart of the product lies an innovative contact-less technology - SteamStretch(TM) - to tackle creases regardless of garment fabric or shape. 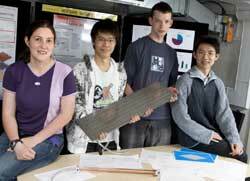 Team: Adrien Motte, Charlie Musgrave, Christina Zhang, Kate Hunter. A giveaway promotional FM radio for use at major events. 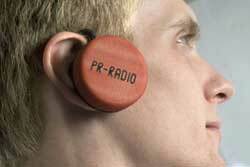 The PR-Radio is a novel marketing tool for businesses that wish to stand out from the crowd. Our ear mounted radio provides high quality FM reception using re-designed electronics that are lower cost and lower power than our competitors’ products. In addition, our radio offers the customer a unique level of customisation by allowing them to specify graphics, shape and colour. This means the device can be tailored to match their company image. An 'intelligent' high street litter bin that automatically separates aluminium and steel cans and discards wrongly inserted items into the general waste compartment. This allows cans to be transported directly to metal recycling plants, avoiding the need to send them to a special recovery plant and thus reducing transport costs and environmental impact. 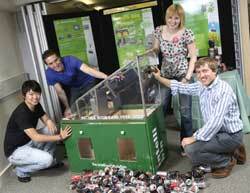 Team: James Colgate, Rachael Mell, Ben Richardson, Ken Zhang. An aid for deaf musicians and young children that transmits a live beat as a tactile stimulus to the performer. The beat is input using a foot pedal by one of the musicians and transmitted via a series of wearable receivers to each member of the group. The four students involved in the project came up with the idea after a visit to the Mary Hare School, the national grammar school for deaf children. Meeting some of the pupils they discovered that some struggled to keep time while performing in groups. While they could use an able hearing conductor, this limited the band's ability to practice on their own. Team: Michael Ansbro, Maria Katunina, Linda Kemp and Glen Walker. 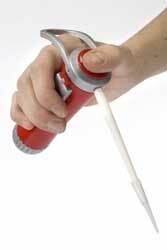 A redesign of the precision pipette one of the most commonly used laboratory instruments, to address ergonomic issues. While current models satisfy the need for precision and reliability, their design falls a long way short in terms of ease of use. They are entirely thumb-operated and are known to cause cases of repetitive strain injury. The students have designed a comfortable, easy-to-use pipette, the Ergopip, which distributes workload to the user's fingers and is just as precise and reliable as existing versions. Team: Jonathan Fraser, Mark Evans, Shu Sun and Rehana Khanam. A passive mosquito trap designed for use in rural southern India, requiring no external power. 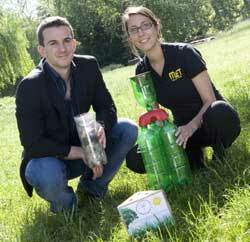 This mosquito trap is designed for use in the developing world, using locally available materials to minimise cost. Made of discarded plastic bottles filled with pebbles and a mixture of yeast and sugar, the trap attracts human biting mosquitoes. The geometry of the trap is such that once inside the mosquitoes cannot escape. The students have also designed an injection moulded model for the Western market, sales from which could subsidise the trap for the developing world. The prototype has been successfully trialled in Bangalore. Team: Andrew Boyce, Man Kit (Alvin) Lam, Rachel Milford and Stephanie Sgoda. A novel shower tray for saving energy and money. HeatSave Shower Tray has an integrated heat exchanger that facilitates energy recovery from waste water. Warm water leaving the shower tray is used to pre-heat cold water entering the system so that less energy is required by the electric shower unit for heating. A typical shower with two regular users will save around £30 per year in electricity, equating to a reduction of approximately 150kg in CO2 emissions. The product is a self-contained unit that takes the place of a standard shower tray. Team: Helen Cavill, David Clough, Li Dong, Matthew Leung. A device to simplify the difficult task of French plaiting. The French plait is a simple method of holding hair back from the face, making it particularly suitable for playing sports, swimming, horse riding and general day-to-day wear. The problem is that it is very difficult to do a French plait in your own hair. The project shows that a hand-held plaiting product is feasible, and with some more development can be sold as a consumer good. French plaiting requires methodical adding of hair into parts of the mechanism, and is the logical next step in the product's design and development. 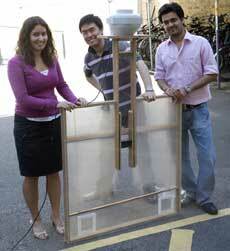 A transportable device producing a column of clean air for use in field surgery. This design aims to provide a localised area of sterile air, via a portable, minimal-installation and easy maintenance system. The air will be filtered using a ‘high efficiency particulate air’ (HEPA) filter which has an efficiency of 99.97% at 0.3µm particle diameter. The potential markets for such a technology are many but we are concentrating on providing clean air sources to operating theatres in rural India, many of which currently have no provision for providing sterile air. 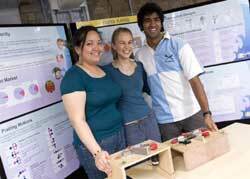 Team: Theerasak Mingarcha, Charlotte Kershaw, Abhishek Mandawewala.